I love ending the season in Abu Dhabi. There are many reasons for it. Firstly, it's what I call an 'easy' race weekend. The weather is stable, usually, the facilities are great, and you don't have to be concerned about safety or security. It seems to put the whole paddock at ease, whether there are still titles or championship positions still up for grabs. Quite often people will plan to stay for a few days after the race for a holiday so there's always that to look forward to as well. I arrived in the early hours of Wednesday morning and a few hours later Johnny, the crew and I met to go and film around Abu Dhabi. The UAE is only 47 years old but has some very impressive buildings. We started at the Emirates Palace, once the most expensive hotels ever built, and then went on to the Sheikh Zayed Mosque and the Louvre Abu Dhabi. We also tried our hand at some of the more adrenaline-fuelled activities, starting with indoor skydiving. Johnny went first and was actually pretty good at it. I thought it would be easy but it's more complicated than it looks. You actually have to really concentrate to remember everything you are told. Lie flat, arms bent in slightly, legs bent up at the knees, chin up and relax. All while being blown skywards from underneath! We also went dune buggy racing at sunset which is definitely one of my highlights of the year. Although, I saw a look in Johnny's eyes I haven't seen before. I can only imagine it was similar to when he was racing in that everything on the periphery was blocked out, including my reminders that we still had links to record, and his only focus was pushing the buggy to its absolute limit. It was a brief but fascinating insight into perhaps the places you need to go to be a racing driver. On Thursday it was finally confirmed that Robert Kubica was going to be one of Williams' race drivers for 2019 and he joined us on Welcome to the Weekend. It's an incredible story and we are all looking forward to seeing him on the grid. I remember talking to him at the Williams season launch at the start of this year and asking him how he would feel walking into the paddock in Australia. He gave a really telling response about how emotional it would be, but also how difficult as he would only be the reserve driver. I can't imagine the emotions he is going to feel when he arrives at Albert Park in 2019. Friday morning started badly! The power in my hotel room had gone off overnight so when I, luckily, woke up and looked at my watch, I had 20 minutes before I needed to be on the bus ready to leave. My phone hadn't charged and so my alarm hadn't gone off and I frantically showered and grabbed what I could hoping I had what I needed for the day. In seven years I have never missed a bus to the track but it was pretty close! On Friday afternoon I got to do something I have been wanting to do all season, go out on track for a hot lap. McLaren very kindly found me a space in the McLaren 570S with Lando Norris as my chauffeur. Not wanting to waste the opportunity, I went armed with some questions to put to him as he took me around the Yas Marina circuit. It was everything I hoped it would be, with plenty of sideways moments, but Lando did say it was a bit off-putting to be answering questions. I have done plenty of hot laps in my time but my last one with a current F1 driver (Ok, Lando is a 2019 driver but you get my drift), was when Felipe Massa took me around the Barcelona circuit the day after testing in 2013 in a Ferrari road car. There is something about the F1 drivers that instils you with absolute faith in them. Despite your every fibre telling you they have lost control, your brain knows they haven't and you enjoy it rather than fear it. On Saturday I was in the pen for qualifying again while the F2 feature race was going on and managed to speak to all but the top three before I had to leave to set up for the F1 Show. While I was there George Russell won the race and the F2 title and it was interesting to watch the scrum around him as he made his way to the press conference room. It was reminiscent of when Nico Rosberg and Lewis Hamilton won their F1 titles in Abu Dhabi and I was pleased to see him getting so much attention for his win. He is a big talent and while 2019 might be too soon for him to be winning races in the Williams, I hope we get to see him shine. Saturday night's F1 Show was great fun. We had started the season in Melbourne with Max Verstappen and Daniel Ricciardo as our live guests and we finished it the same way. They were messing around from the moment they arrived and there were plenty of laughs. It is what the show was always meant to be from the start of the year. It's something I have really enjoyed, seeing the drivers relax and have fun, and compete at something totally different. Whether it was darts or Jenga, remote-controlled cars or Mario Kart, they always wanted to beat their team-mates and they were always good sports. If you ask for an interview you get a strict five minutes or so, but if the drivers come on the show and laugh and have fun, that five minutes usually goes by the wayside and the press officers are happy to see their drivers smiling and enjoying themselves. Apologies though to the engineers as I know a fair few drivers were late for their briefings because they were enjoying themselves too much! Sunday in Abu Dhabi always has a great vibe. All the drivers are fired up to finish the season with a good race despite quite often there being not much at stake in terms of the championships. There is a real end-of-term feeling and it helps that it is usually sunny and warm. It's the perfect send off. And what a send-off for Fernando Alonso. He had walked into the drivers' briefing room on Friday evening for his last such meeting to find that the circuit had painted the walls in tribute to him. There was a final team photo on Saturday and on Sunday he was given a guard of honour from his McLaren team. I caught up with him as he came off the bus from the track parade and asked him how it was and how he was feeling. "It was good. It was too long, too long," he said. "We need to make it shorter because I get more and more emotional!" he smiled, as he walked away towards a live interview being shown to a huge crowd that had gathered at the Fernando Alonso Museum and kart circuit in Asturias to watch his last race. I also spoke to Esteban Ocon on his way to the track parade about he was feeling as well. It's such a shame that he doesn't have a drive for 2019 but the confidence with which he speaks about 2020, it sounds like he knows he already has somewhere sorted for then. Still it's hard to see someone of his talent not in an F1 car and I just hope he gets some regular Practice One outings to keep him race sharp. He won the race, but nearly didn't make it out on track! 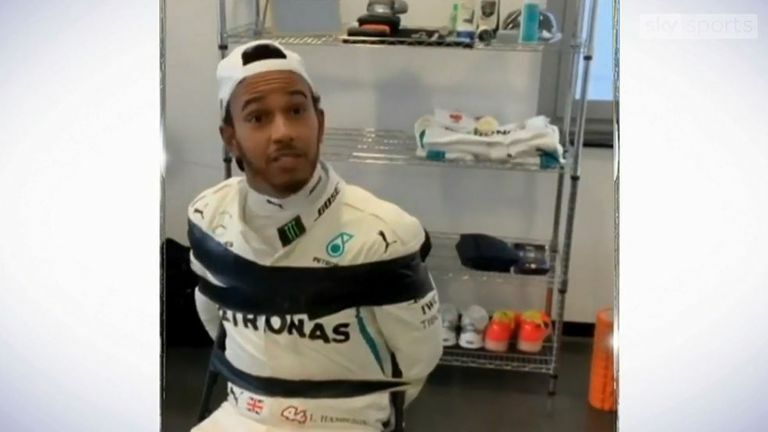 Lewis Hamilton was 'held hostage' by actor Will Smith before the Abu Dhabi GP. I also managed to interview Will Smith as he walked towards the grid for the start of the race. You often get big celebrities at races and it's always awkward trying to talk to them. The celebrity themselves is usually very amenable with the odd exception, but the people around them can be tricky. Sometimes the best option is just to bowl in and smile and ask if it's ok to ask a couple of quick questions for Sky. He said yes straightaway luckily but, as you may have seen, was also doing his own filming that weekend so he filmed our interview too. It was only brief but he was brimming with excitement and seemed genuinely happy to be there and was soaking up every second. Some celebrities are more restrained in their responses so it was great to see much enthusiasm from him. And I can't wait to back there in Australia, see you in 2019!